What Is Whole Body Fitness? We all want to be fit. However, becoming a fit human being involves far more than just developing certain muscle groups through activities like running or lifting weights. Whole body fitness also includes how you think and the way your brain works. Your brain plays an essential role in your level of fitness. With NeuroMovement®, rather than focusing attention on your muscles, we focus on your brain. We provide the conditions that flood your brain with the new information it needs to successfully create the neural patterns that lead to overcoming pain, and achieving better fitness and whole body health. Anat Baniel has defined the 9 Essentials, each one providing an easy and powerful way to flood your brain with new information that it needs. These Essentials wake up your brain to create positive changes in your body and fitness levels. Whether you’re already a world-class athlete or a beginner on the path to greater fitness, your brain is at the ready to make movement easier and you more powerful. With NeuroMovement® and the 9 Essentials, you will increase your flexibility, strength, coordination, and stamina. Why is it so difficult for so many people to follow through on their fitness goals and routines? The answer is that there are certain myths about what it takes to become more fit, that contradict what our bodies really need and require. Trying to achieve fitness is based upon myths that make it challenging, if not impossible, to commit to and achieve a successful fitness regime. If your brain has not gotten the information it needs to be able to create the necessary patterns of the movement you are trying to do, you may simply fail and eventually give up. Or you’ll do the movement poorly, making it painful or very difficult to do, and at times, resulting in injury. 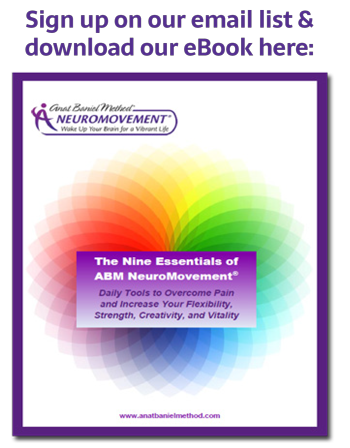 By using NeuroMovement® and the 9 Essentials, you will access the power of your brain and challenge these commonly accepted beliefs about fitness and health. Learn more about the Fitness Myths and how to succeed. These fitness tips are for men or women! Next Steps: How Can You Overcome Pain, Reduce Injuries, and Reach Better Whole Body Health? Read Anat Baniel’s book Move Into Life—download free chapters here. NeuroMovement® can help you reach higher levels of fitness and health!